“Bigler’s assemblage sculptures sample and recombine lost realities, bringing dream-like new life and significance to disconnected fragments. Buttons and bones, cowry shells, honey combs, or antique labels are typical elements in these small works (usually less than a foot square). In the piece titled “Pearl” vintage mother of pearl buttons are still affixed to their original card. In several other works tiny bones and other artifacts are securely fastened in rows. These seem to hint of an arithmetical/metaphysical notation, like sums of personal and public signs; they might be transactions with the past or messages to another world. Some larger, looser combinations invite the viewer into their mix of symbols and evocations, and are similar to the Fluxus boxes that Bigler admired. But more often his wall-hung small boards, plaques and shadow boxes are tightly bound, wrapped in layers of thread, string and wax or varnish…..
Roy Bigler graduated from Kent State University in 1984 with a B.F.A. During his time at Kent State he participated in experimental work inspired by the Fluxus and Dada art movements. The ideas of randomness and documentation of everyday life and objects that are normally ignored as being beneath notice (Low Art as opposed to Fine or High Art). While at Kent he participated in mail art exchanges involving small, sly, items made for mass consumption but which actually subvert the idea of mass consumption by their individual nature thereby becoming a cynical commentary on capitalistic society. He also was involved in making music, performance art, poetry, and films: all forms of art that take place in and of the moment of time as they are experienced by the viewer. This interest in the ephemeral nature of time and the preservation of moments of time continued throughout his career and informed the making of his sculptural objects and later his “time capsule” boxes. 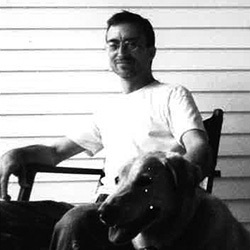 Bigler was part of a group of Kent State artists who subsequently moved to the Tremont neighborhood of Cleveland. They helped form the basis of the gentrification that took place in Tremont during the 1980’s and 1990’s. The artists that were part of his group of friends included Steven B & Mother Dwarf, Beth Wolfe, Frank Green, Dan Tranberg, Terry Durst, Jeff Chiplis, Dave Madigan, Gee Sun Park and later Dana Depew. Almost all of these artists worked in some way with found objects. Bigler’s work was exhibited widely in the Western reserve including solo and group shows at Spaces Gallery, The Sculpture Center, Southside Gallery, Sweetwater Center for the Arts and The Akron Art Museum.